This article is about the song by Guns N' Roses. For other uses, see Don't Cry (disambiguation). 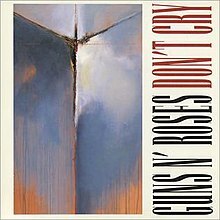 (1991) "Live and Let Die"
Stradlin and Rose wrote the song (with the working title "Don't You Cry Tonight") in March 1985, shortly after Guns N' Roses was formed. "Don't Cry" features Shannon Hoon of Blind Melon as a co-lead vocalist. Hoon sings an octave higher than Rose, and his voice is placed further back in the mix. Along with "Estranged" and "November Rain," it forms a narrative inspired in part by the short story "Without You" by Del James. The song peaked at #10 on the Billboard Hot 100, becoming the band's fifth Top 10 hit there. The official music video for the song was directed by Andy Morahan and Mark Racco. John Linson was the producer of the video. With our video for "Don't Cry," and the fight that Stephanie Seymour, (Axl's then-current girlfriend) and I had over the gun, you don't necessarily know what's going on. But in real life that happened with Erin Everly (Axl's ex-wife) and myself. I was going to shoot myself. We fought over the gun and I finally let her win. I was kind of mentally crippled after that. Before shooting our documentary, I said, "This seems really hard, 'cause it really happened." And the night we wrote the scene, my friend Josh said, "Okay, how are you going to play that?" He wanted to rehearse and I was like, "Look, leave me alone." But he kept pushing until, finally, I stood up. I had this cigarette lighter that looked like a real gun and I said, "Look, I'm gonna do it like this." And I just went over and slammed around in the hallway a bit and threw the gun and said, "Is that good enough for you?" Izzy Stradlin had left the band by the time the band came to film the video and therefore does not appear in the video for the song he co-wrote. A fan can be seen holding up a sign saying 'Where's Izzy' in the video. "Don't Cry" was performed quite frequently during the early tours and the Use Your Illusion Tour. It was absent from the early legs (i.e. 2001–02) of the Chinese Democracy Tour but reappeared to an extent in 2006, as guitarist Bumblefoot began using an instrumental version of the song as a guitar solo spot. In 2007, during the Bumblefoot solo spot, Axl came on stage to sing along to the solo on two occasions, marking the first times since 1993 that Axl had sung it live. "Don't Cry" made another return during the 2009/2010 World Tour, with Axl singing along with the solo spot on each occasion that it has been played. A recording of the song from the Tokyo Dome was released on the album Live Era '87–'93 and a VHS/DVD. ^ "Raz Cue - Rocks". Raz Cue - Rocks. ^ "Guns N' Roses – 'Don't Cry' – a dynamic analysis". ^ Wall, Mick (2008). W.A.R. : The Unauthorized Biography of William Axl Rose. St. Martin's Press. p. 368. ISBN 978-0-312-37767-0. ^ Garcia, Alex S. "mvdbase.com - Guns 'n' Roses - "Don't cry"". Music Video DataBase. Retrieved November 2, 2015. ^ "Guns N' Roses: Makin' F@*!ing Videos Part I - Don't Cry (Video 1993) - Full Cast & Crew - IMDb". imdb.com. Retrieved November 9, 2016. ^ "Articles > Axl gets in the ring". Here Today... Gone To Hell!. Retrieved July 28, 2011. ^ "Australian-charts.com – Guns N' Roses – Don't Cry". ARIA Top 50 Singles. Retrieved March 25, 2017. ^ "Ultratop.be – Guns N' Roses – Don't Cry" (in Dutch). Ultratop 50. Retrieved March 25, 2017. ^ "Lescharts.com – Guns N' Roses – Don't Cry" (in French). Les classement single. Retrieved March 25, 2017. ^ "Offiziellecharts.de – Guns N' Roses – Don't Cry". GfK Entertainment Charts. Retrieved March 25, 2017. ^ "The Irish Charts – Search Results – Guns N' Roses". Irish Singles Chart. Retrieved March 25, 2017. ^ "Dutchcharts.nl – Guns N' Roses – Don't Cry" (in Dutch). Single Top 100. Retrieved March 25, 2017. ^ "Charts.nz – Guns N' Roses – Don't Cry". Top 40 Singles. Retrieved March 25, 2017. ^ "Norwegiancharts.com – Guns N' Roses – Don't Cry". VG-lista. Retrieved March 25, 2017. ^ Salaverri, Fernando (September 2005). Sólo éxitos: año a año, 1959-2002 (1st ed.). Spain: Fundación Autor-SGAE. ISBN 84-8048-639-2. ^ "Swedishcharts.com – Guns N' Roses – Don't Cry". Singles Top 100. Retrieved March 25, 2017. ^ "Swisscharts.com – Guns N' Roses – Don't Cry". Swiss Singles Chart. Retrieved March 25, 2017. ^ "Guns N' Roses: Artist Chart History". Official Charts Company. ^ "Guns N' Roses Chart History (Hot 100)". Billboard. Retrieved March 25, 2017. ^ "RPM 100 Hit Tracks of 1991". RPM. Retrieved November 23, 2017. ^ "Italian single certifications – Guns N' Roses – Don't Cry" (in Italian). Federazione Industria Musicale Italiana. Retrieved July 4, 2014. Select "Tutti gli anni" in the "Anno" drop-down menu. Select "Don't Cry" in the "Filtra" field. Select "Singoli online" under "Sezione". ^ "American single certifications – Guns N' Roses – Don't Cry". Recording Industry Association of America. Retrieved July 4, 2014. If necessary, click Advanced, then click Format, then select Single, then click SEARCH.